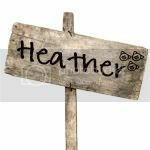 Have fun Heather it is time to take it easy and have a change of pace we all need it. I'm headed back HOME to help at a fundraising auction for our church and listen to some good 'ole Pat Green at the Fayette County Fair!! Very hip! Way to plan ahead and make that family time! And what better way to do that than Americans pasttime and some good ol music and classic comfortfood! Enjoy, soak it all in and eat a slab of ribs and two cups of baked beans for us!